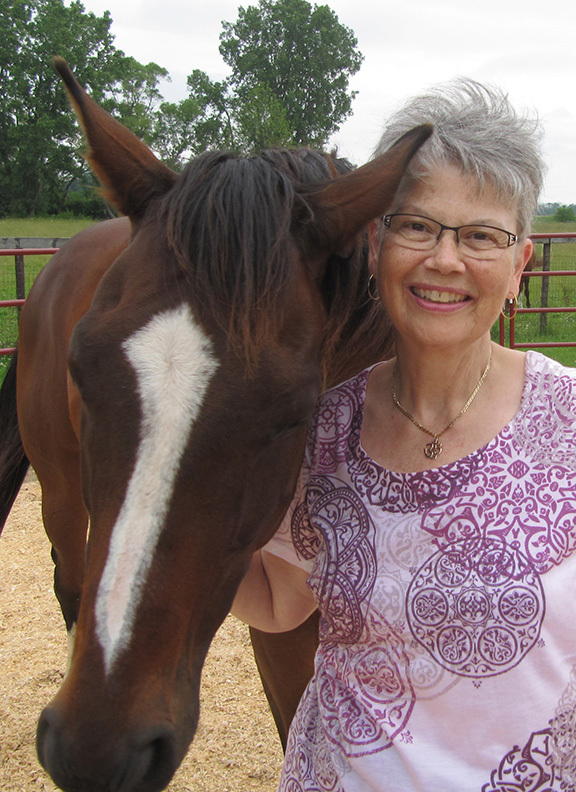 Pat is a certified FEEL Facilitator (Facilitated Equine Experiential Learning) working in the Durham Region. She discovered the world of horses later in life. Pat began Natural Horsemanship lessons and intuitively and experientially knew there was more to the horse/human relationship, even though she didn’t yet have the tools to access the ‘more’. Her excitement grew as she experienced, first-hand, the healing ability of the horses. Pat observed their innate strategies to manage their stress reactions. Since stress management was Pat’s passion, seeing this in the horses stoked the flames! Pat felt that these beings had much, much more to teach humans, if we would only let them! They had a way of being that was so completely in the moment, a skill that normally takes us a lifetime to learn to practice consistently. When living from this place, a deeper emotional vitality, spiritual connection and mental serenity are possible. This is what drives her to share this way of being. Pat has been attracted to horses her whole life. However, being a city girl, horses were not a part of her experience. She spent 10 yrs raising her family and another 25 yrs as a Civil Servant in various capacities. Her career as a Civil Servant presented her with the opportunity to expand her understanding of the methods by which adults learn at various stages in their lives. It provided her with a vehicle to develop her compassion and understanding when people are faced with challenges in their lives. These years also allowed Pat to learn the importance of diplomacy, flexibility and non-judgementalism. After experiencing, both in herself and others, the powerful effects of unmanaged, negative stress, Pat became passionate about empowering others to self manage the stress in their lives. Knowing the effects nutrition can have on stress, Pat obtained her Bachelor of Applied Science in Nutrition, planning on a full-time practice when she took early retirement from the government. While practicing part-time, she developed and taught stress management workshops, also part-time. After retiring, she recorded CD’s that teach and guide people, using one method of stress reduction, the power of the mind! All Pat’s prior experience came together with her horse interactions and learning’s. Being a FEEL Facilitator, with the horse as the teacher, is the outlet that allows her to share what has taken her many years to find. These beings point us in a direction of self-empowerment, self-knowledge and self-respect through their willing co-operation and collaboration. Their teachings are gentle, subtle, rapid, extremely effective and always authentic. Pat has learned that with the help of our equine partners, we learn to be present in this moment. We can live a calm, healthy, powerful life. Pat has learned that: Horse & Human = Power & Presence.